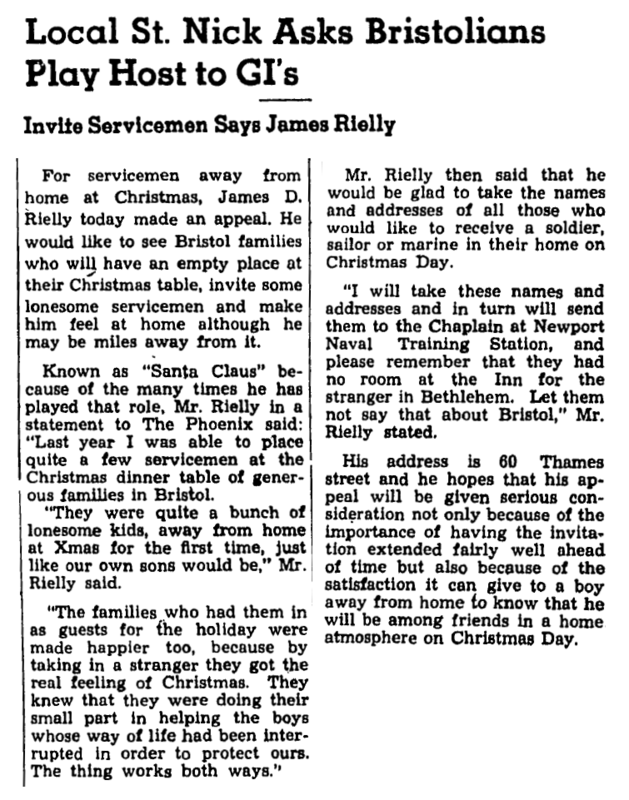 For servicemen away from home at Christmas, James D. Rielly today made an appeal. He would like to see Bristol families who will have an empty place at their Christmas table, invite some lonesome servicemen and make him feel at home although he may be miles away from it. We continue Jim Rielly’s work today by working closely with local veterans and military family support groups in our community. Learn more about our foundation and how you can help! 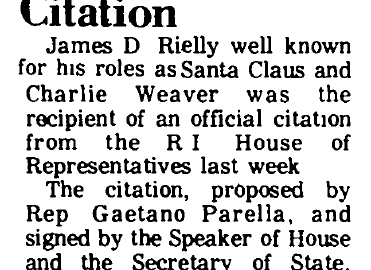 On January 31, 1979 — thirty-nine (39) years ago today, Senator Claiborne Pell entered Jim Rielly’s name to the United States Congressional Record. In 1979, Jim Rielly was celebrating 51 years of donning the Red Suit. Jim went on to portray the Jolly Old Elf for the next 12 years, making him the longest running Santa Claus to date. Mr. President, before the pleasures and memories of the recent holiday season slip our minds completely, I would like to share with my colleagues a tribute to a truly remarkable “Santa Claus” from Rhode Island. I am referring to Mr. James D. Rielly of Bristol, R.I. This past holiday period marks the 51st year in which Jim Rielly has donned red suit and white whiskers and with a large bag of goodies has visited hospitals, senior centers, and children’s centers throughout the East Bay area of Rhode Island. His is a particularly effective and welcome presentation of Saint Nicholas because Jim Rielly is himself the personification of the spirit of cheerful, selfless giving of oneself for the benefit of others. I am proud to be among the many thousands of Rhode Islanders who claim to be good friends of Jim Rielly, and I join all of those friends in the mutual hope that Jim will be bringing his special brand of seasonal joy to Rhode Island for many years more years. In 2010, Jim Rielly was entered into the International Santa Claus Hall of Fame in recognition of his extraordinary selflessness and kindness, and his contribution to the Santa Claus community. Rhode Island based charity helps the children and families of veterans, active military, and first responders. The James D. Rielly Foundation is proud to announce that it has been formerly granted tax-exempt status under Section 501(c)(3) of the United States Internal Revenue Code. Contributions donated to the James D. Rielly Foundation are fully tax-deductible retroactive to the founding of the organization. The James D. Rielly Foundation is also now eligible to apply for government and foundation grants, which will further broaden its access to resources and strengthen its ability to serve the members of the community. Funded entirely by private donations, The James D. Rielly Foundation is a 501(c)(3) non-profit, volunteer organization founded by Michael Rielly to honor the life and legacy of his grandfather, James D Rielly. The Foundation provides charitable support to the children and families of veterans, active military, and first responders. Born in 1908, James (Jim) D. Rielly was a lifelong resident of Bristol Rhode Island and well known throughout New England for his kindness, generosity, and countless charitable acts. Over the course of his lifetime, Jim Rielly was the recipient of numerous awards and received letters of recognition from celebrities and dignitaries from all over the world; Eleanor Roosevelt, Senators Theodore Francis Green, Claiborne Pell, and John Chafee, Presidents Dwight Eisenhower and Richard Nixon, and even his Holiness, Pope John Paul II, just to name a few. 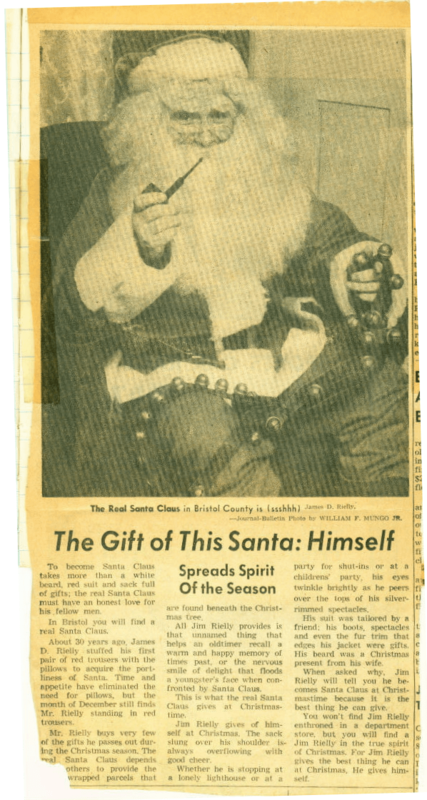 Jim Rielly was best known as Rhode Island’s own “Santa Claus”, where he portrayed the role of Jolly Old St. Nick for over 60 years. Much of his time in the red suit was spent bringing joy to the children and families of servicemen and women and first responders. The IRS letter granting James D. Rielly Foundation its 501(c)(3) tax-exempt status is available upon request. For donation inquiries, please contact info(at)jdrfoundation(dot)org or visit www.jdrfoundation.org. 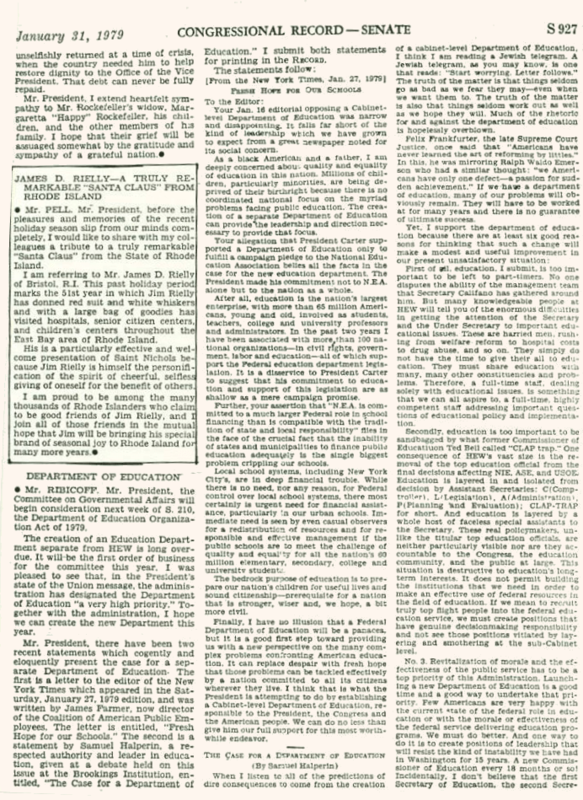 The James D. Rielly Foundation is a 501(c)(3) non-profit organization, organized exclusively for charitable, religious, fraternal organizations, and educational purposes, including, the distribution of funds primarily to organizations that qualify as exempt organizations under 501(c)(3). The James D. Rielly Foundation believes in giving back to the community both locally and nationally. We believe helping those in need will inspire others to do the same and in turn, improve the quality of life for all. To learn more, visit: www.jdrfoundation.org. Follow us on Facebook and LinkedIn. A big thank you to Bristol Town Administrator Steven Contente and the Bristol Department of Public Works for repairs to Jim Rielly’s bench in Rockwell Park.